Blue whales are one of the rorquals, the blue was initially studied by Scottish naturalist Sir Robert Sibbald in 1694 hence the old name "Sibbald's Rorqual". Rorquals are characterised most obviously by the longitudinal pleats that allow the throat to expand enabling the whale to take in huge gulps of food-laden water before expelling the water through the baleen plates which filter out the food - small fish or plankton - and then gulping it down. The pleating increases the volume of water in a single mouthful by an estimated 6x over non-expanded size. There are between 55 and 68 of these pleats or ventral grooves that extend as far down as the navel (yes, whales have belly buttons). The whale looks like one of those weird deep-sea gulper fish when it has a mouth-full before it expels the water (but bigger!). At the height of the feeding season in Antarctica an adult blue whale consumes 3-4% of their own body weight in krill per day. For a 150 tonne blue whale, that is 6 tonnes of food a day consisting of some 6 million individual krill. When the days are long and the food is abundant the feeding goes on almost without stopping. Blue whales are thought to feed for 8 months of the year and then fast for the other 4 living off their reserves of fat or blubber built up during the days of plenty. Blue whales are light grey/blue to dark grey while at the surface, but seen underwater they are a luminous aqua blue, they can be distinguished from other large whales as they have mottled skin. The whalers would sometimes refer to the blue whale as the "sulphur bottom". When they have reached Antarctic waters in the austral spring, day light is near to if not already 24 hours a day and phytoplankton are growing at their peak. This phytoplankton growth is mainly in the water column, but some species of diatom algae start to grow on the whales themselves, the blue whale and the green algae give a yellow effect so earning the name sulphur bottom. Unlike some other whales, blues are almost completely free of external parasites and hangers-on such as barnacles, their streamlined shape and fast swimming speed probably makes it impossible for them to attach and hang on unlike with the slower moving whales such as the right whales. There are three recognized subspecies of the blue whale. 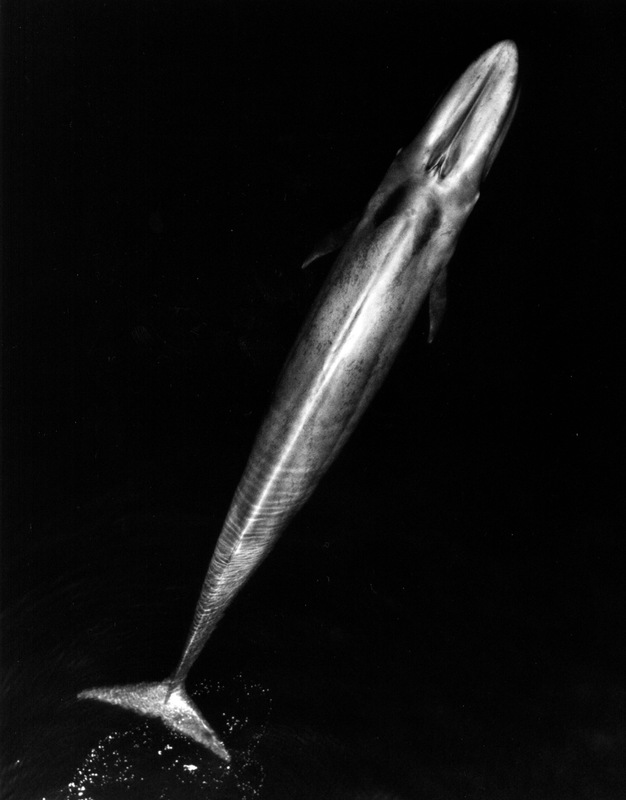 The pygmy blue whale, Balaeopnoptera musculus brevicauda is found in the Southern Hemisphere and northern Indian Ocean. This is shorter with a maximum length of about 24m ("pygmy" is only a relative term when it comes to describing blue whales!) and has a relatively larger head. It is possible to distinguish pygmy blue whales from other blue whales at sea if a good view can be achieved. The body shape is more 'torpedo-shaped' (with a relatively narrower head) for the "standard" blue whale. The Northern Hemisphere subspecies is known as B. m. musculus these are around 23-27 m long, females being larger than the males. 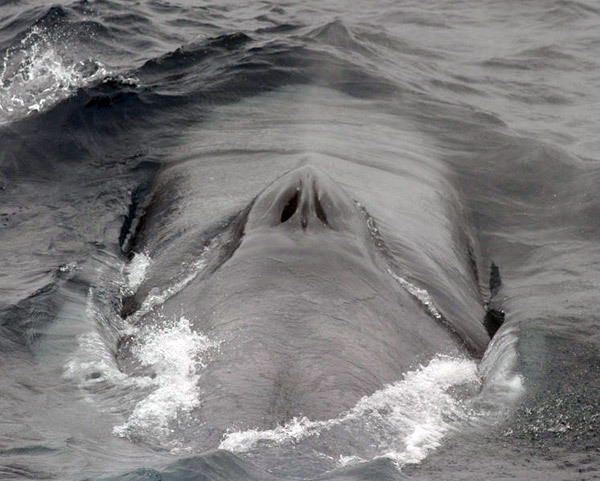 The Antarctic blue whale subspecies, B. m. intermedia is the largest of all, and measures up to 29 m, although a specimen over 33 m has been recorded. Blue whales hold just about every record going for animal size. They are larger than any dinosaur ever was, growing to such a huge size by tapping the food chain low down near the source of energy and by being aquatic so their great bulk is supported by the water. It is very difficult to measure how heavy such huge animals might be, it isn't possible to pick them up and weigh them or walk them onto some kind of scales or weighbridge like we could with other animals. Any weights are therefore estimates. The original figures for the weight of blue whales were determined in 1926 by the weighing a part at a time by a whaling company of an individual being processed. This set a benchmark and with more modern methods of estimating volume, so estimates can be made. Average fully grown blue whales are around 100-120 tonnes and particularly large individuals have been estimated at 200 tonnes! An average blue is about the equivalent of about 25 fully grown African bull elephants. Another way of looking at it is that a human is to a whale as a mouse is to a human. All figures about blues are awesome, their circulatory system pumps 10 tonnes of blood through the body using a one tonne heart the size of a small car (such as a VW Beetle). A child could crawl down the whales' main blood vessel, the aorta. In its development, a blue whale calf can drink 100 gallons of its mother's milk and gain 90kg (200lbs) per day - that's 3.75kg (over 8lb) an hour! the equivalent mass of a large (2m / 6'6") human adult each day. A blue whale laying on its side would be 3m (10 feet) high, probably more than the room you are in now. The width across its tail flukes (flippers) is about 6m (20 feet), a full grown man standing on tip-toe and reaching as high as he could wouldn't reach as far as from the tip of one tail fluke to the middle of the tail where the two flukes meet. It's fins are the size of large dining tables and its 3-5 tonne tongue would overload a good sized truck. The life expectancy of blue whales is particularly difficult to estimate, it is certainly beyond 25 years and has been estimated as from 30 to 80 years with suggestions of as much as 100 years. The "blow" of a blue whale is a powerful blast of water as thick as a mans arm reaching up to around 6m (20ft). Another impressive statistic about blue whales is the loudness of the sounds that they make. Whales communicate regularly by sound with each other when they are in groups or "schools". Sound travels far better in water than in air and while whales do not have any external ears, they have a very good sense of hearing, their flesh and bone carry the sound to their ears that are buried in their skull. Blue whale sounds from the North East Pacific. Sound has been speeded up 10 times. Play Blue whale sounds from the Atlantic. As small animals tend to make high pitched squeaking sounds, so larger animals make deep rumbling sounds. Divers have reported blue whale vocalizations as being "felt" more than heard. Blue whales make very deep low-pitched sounds that have been recorded as high as 188 decibels (at 1m from the sound source) - far and away the loudest sound made by any animal. A passenger jet at take off makes a noise that is 120 decibels. Blue whales sound can be heard at a distance of over 500 miles (800 kilometres) - as long as you can hear that frequency (i.e. if you're another blue whale). Surprisingly, despite almost every other measurement being so large, a blue whale's oesophagus or gullet is a mere 4 inches or 10 cm in diameter, so it would have problems swallowing a whole grapefruit, this could never have been the whale that swallowed Jonah. Blue whales may be found world wide, though there are two distinct populations a northern hemisphere population and a southern hemisphere population. Each population spends the summer in high latitudes, Arctic or Antarctic feeding continually and growing fat on the high productivity that long days bring to coastal waters. In the winter months in their respective hemispheres, they migrate to tropical or temperate waters to mate and calve. As the two hemispheres have opposite seasons, so the two populations do not intermix and remain distinct. In addition to this, there are two separate northern populations, one in the Pacific and one in the Atlantic. It is generally the larger and older animals that will venture into the highest latitudes of the arctic and Antarctic, furthest north or south. When beginning a dive, blue whales lift their tail flukes only slightly out of the water. They may blow frequently, every 10 to 20 seconds for 2 to 6 minutes, diving for 5 to 20 minutes (although they are able to stay under for longer). Short dives (10-20 minutes) are most common, although dives of up to 30 minutes have been recorded. Blue whales are generally fairly shallow divers to no more than 100 m depth, as that is where their prey is. It is believed that they can dive to 500 m. Blue whales have occasionally been observed breaching (lifting all or most of their body vertically or near vertically out of the water). 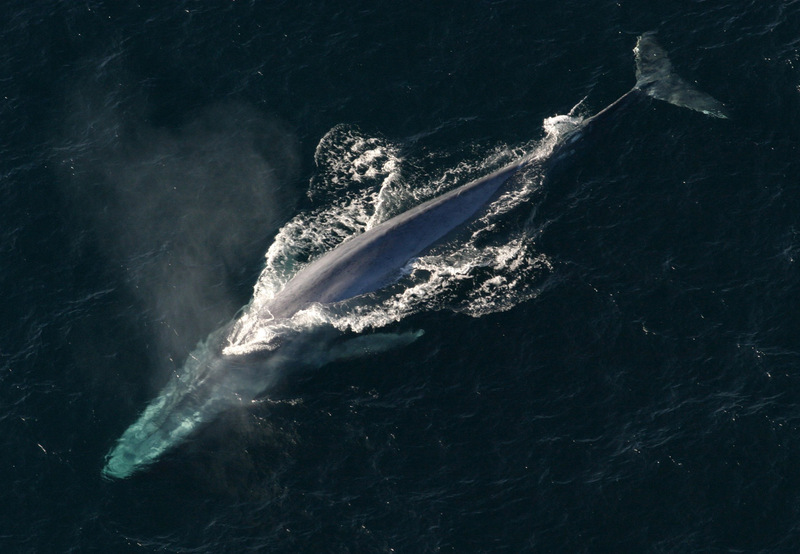 Blue whales are usually encountered alone or in pairs. Like the other large baleen whales, it seems that they form schools that are loose associations mainly in areas of high food concentration. In such circumstances many animals feeding together can aid each others effectiveness. Mixed schools of blue and fin whales have been reported.